Zhuo Xiangmei, a Li Minority woman from Shilan Village, Nansheng Town, Wuzhishan City in Hainan, spent 3 years on embroidering a cross-stitch of “Along the River during the Qingming Festival”. 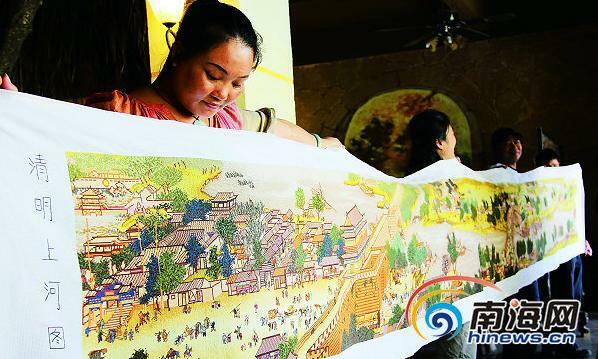 The cross-stitch has a length of 6.2 meters and a width of 0.71 meters, displaying the graceful landscape and busy downtown streets scenery of Bianlang (now Kaifeng in Henan province), the capital city of Northern Song Dynasty. The 33-year-old woman said she purchased a cross-stitch of “Along the River during the Qingming Festival” in Haikou 3 years ago, and then she devoted her sparing time on embroidering. Last month, a boss desired to buy her cross-stitch for RMB70,000, but Zhuo Xiangmei refused it as she said the cross-stitch is not only a embroidery, but a painstaking effort of her.